Wash, peel and dice the onion, and place in a large covered glass or ceramic baking dish. Wash, peel and crush the garlic and add to the onions in the baking dish. Add the olive oil and red pepper sauce and mix the ingredients together. Bake in a microwave oven on "high" for 5 minutes, or in a conventional oven at 350º F. until the the onions become slightly translucent. While the onions are cooking, wash and peel the carrots and thinly slice by hand or in a food processor. When the onions are cooked, add the carrots, mix, and cook for another 5 minutes. While the carrots are cooking, wash and chop the chard by hand or in a food processor, and add to the cooked onions, garlic and carrots. Open the can of tomatoes and pour the liquid into the baking dish. Cut the tomatoes into bite size pieces and add to the baking dish. Open the can of chick peas and add the drained chick peas to the baking dish. 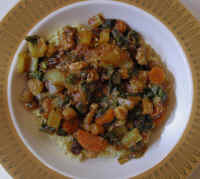 Add the raisins, walnuts and curry powder (make your own or use your favorite pre-blended curry powder). Mix well and bake until the chard is tender. Mix about every ten minutes during the cooking process. Cook the basmati rice in a covered glass pot on the stove top (we suggest cooking 2 cups of rice in 4 cups of water). Serve the curried chard over a bed of basmati rice.